It's Monday--Picture Books Past. 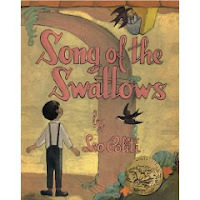 Leo Politi won the Caldecott Medal in 1950 for Song of the Swallows. Though he is strongly associated with hispanic culture and Southern California, he was actually an Italian American who was born in Fresno. He would have been 100 years old in 2008 and here is a website about the Leo Politi Centennial. There's quite a bit of interesting stuff, if you poke around a bit there. Here's the entry about him on Wikipedia. Some of his books have been republished by the Getty Museum in LA. In his pictures and words, one can see his respect for children and his love of capturing their worlds.